personnel. Intermediate or ITI or 10+2 with Maths Physics and Chemistry studied candidates are eligible to apply online for this BSF Head Constable Radio Mechanic/Operator Jobs. Candidates selection will be through written exam, PET, PST and Descriptive tests followed by documents verification and medical exam. 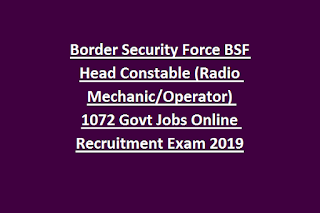 Candidates can apply online for this BSF Head Constable Radio Operator/Mechanic jobs from 14-05-2019 to 12-06-2019. Written exam pattern and syllabus for this BSF Head Constable Radio mechanic/Operator jobs is updated in this notification. More details of this BSH Head Constable RM, HC RO posts physical tests, selection process, age limits, and other information is given below. For this BSF Head Constable Radio mechanic and HC Radio Operator working personnel of BSF Constable GD/Tradesman who is having 3 years of service they are eligible to apply under 25% reservation quota. 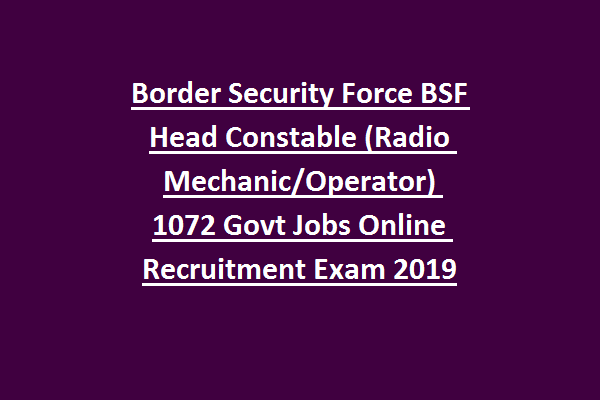 There are total 1072 posts in this BSF HC RO and RM vacancies recruitment 2019. Not below 18 years or over 28 years as on 12/06/2019 (closing date) for OBC Category. General Category 40 Years, OBC Category 43 Years and 45 Years. HC Radio Mechanic-Inter with MPC or ITI with Radio and Television, Electronics, COPA, DPCS, Electrician, Fitter, IT & ESM or Mechatronics or DEO. Candidates selection will be held based on Preliminary exam OMR Based, Physical Standards tests, Physical Efficiency Tests and Descriptive tests and Medical Exam. BSF HC Radio Oepartor/Mechanic Written exam will be conducted for 200 Marks. Total 100 question will be given. For each correct answer 2 marks will be given and for each wrong answer 0.50 negative mark will be given. Exam syllabus for Maths, Physics & Chemistry subjects of 10+2/Intermediate of CBSE state boards. For Part IV Syllabus will be Current affairs, History, Geography and General Science. Apply Online for these BSF Head Constable jobs from 15-05-2019 to 12-06-2019 through official website of www.bsf.nic.in. Exam hall ticket/admit card, exam syllabus and pattern, exam result, physical tests details and other related information will be updated in this website only.